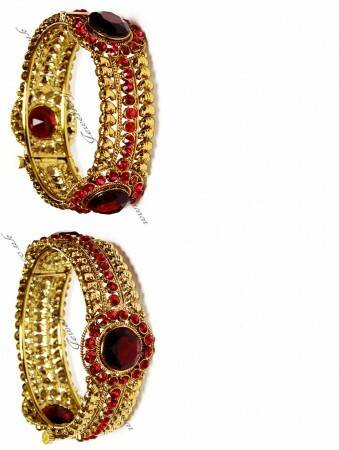 Indian bangles in antique-M gold & maroon red. Set with crystal diamonte stones. Size: 2.10 (x-large) - although there is a screw fastening so will fit other sizes. Bangle thickness: 2.8cm aprox max. Other colours available - enter the design NAME only (eg Jaina) in the Search Box, to see all colours. This set has stunning, rich looking coloured faux gems.